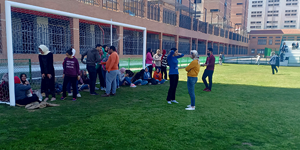 The faculty of Pharmacy and Drug Manufacturing organized a sports day on Tuesday, 19 March, 2019. This was held from 12 pm to 2.30 pm at the university’s playgrounds. About 150 students participated in the day where they enjoyed playing football and engaged in other entertainment activities like tug-of-war and sack race. The coordination of the day was managed by a number of faculty members and teaching assistants.